Free Rhapsody Trial | Stream Music for FREE for 30 days! Home / Freebies / Free Stuff Online / Free Rhapsody Trial | Stream Music for FREE for 30 days! Sign up today for a Free Rhapsody Trial and you can stream music for FREE for 30 days. Not just any music, pick what you want to hear! Rhapsody has millions of songs, entire albums and artist hits spanning the decades. Not just internet radio, but the power to play exactly the songs you want wherever you are. FREE streams and downloads for 30 days! Sign up today for FREE. You can cancel at any time. Your first 30 days are free. Your credit card will be charged $9.99 per month if you do not cancel within the free trial. So why not give it a try! 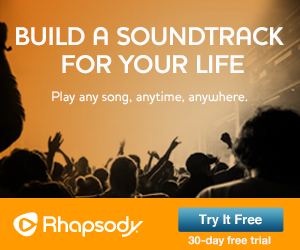 Sign up for your Free Rhapsody Trial today! 8 Free Christmas Cards- Just Pay Shipping!